Daniel Murphy’s full name is Daniel Thomas Murphy and he is a professional baseball player who is currently with the Washington Nationals of Major League Baseball (MLB) as their second baseman. Before playing for the National, he made his professional debut in 2006, after being selected in the 13th round (394th overall) of the 2006 Major League Baseball draft by the New York Mets. Although Murphy primarily plays as a second baseman, he is equally good at playing the first base, third base and also the left field. The Florida native has won the MLB All-Star title thrice – 2014, 2016 and 2017 respectively. He also won the National League Championship Series MVP Award in 2015. In 2017, Dan won his second consecutive Silver Slugger Award, and officially became the best offensive National League second baseman of the year. Check out other fascinating and thrilling facts about this amazing player. Murphy was born on the first day (1st) of April 1985 in Jacksonville, Florida. He is the first of three children born to Tom and Sharon Murphy. His two younger siblings are Jonathan and Tricia Murphy. He attended Englewood High School and Jacksonville University. He began playing baseball as early as five-years-old and continued to play the game both in high school and college. While at Jacksonville University, he played college baseball for the Dolphins under head coach Terry Alexander. He mostly played as a third baser but he was also occasionally slotted into right field where he also functioned well. He averaged .398 batting average in 2006 which led to him being named the A-Sun Baseball Player of the Year. Daniel Murphy went professional in 2006 after he was selected in the 13th round (394th overall) of the 2006 Major League Baseball draft by the New York Mets. Rather than making his debut immediately, Murphy spent the next months receiving treatment for a knee injury he sustained during his college career. Soon he was fit again and spent the entire of 2007 season with the High-A St. Lucie Mets of the Florida State League. The following season (2008), he began with the Double-A Binghamton Mets before being promoted Triple-A New Orleans Zephyrs. By August 2008, Murphy was the fifth Mets rookie to record 10 hits in his first 20 at-bats. His first home run came at Shea Stadium in a match against the Florida Marlins. Daniel ended the season batting .313, with two home runs and 17 RBI. He began playing left field and continued the next year. Carlos Delgado had to undergo hip surgery and thus, Murphy was moved to first base. By the end of the 2011 season, he had the third highest batting average in the National League. However, he did not have enough at-bats to qualify as a league leader. Murphy was also nominated for the 2012 MLBPAA Heart & Hustle Award which unfortunately was won by Mike Trout of the Angels; he was also named the National League Player of the Week. In 2014 he was named to his first Major League Baseball All-Star Game, his second came two years later (2016) and the third the following year (2017). At the 2015 National League Championship Series (NLCS), Murphy hit a home run in six consecutive postseason games to become the first in the history of the Major League to do that beating Carlos Beltrán’s record, he also became the second after Lou Gehrig, to have a hit, a run and an RBI in seven consecutive postseason games. In the same year, Dan broke Mets’ franchise record for most home runs in the postseason, a record previously held by Mike Piazza. He also recorded .529 hits, four home runs, a double and six RBI to be named the 2015 NLCS MVP. During the 2015 offseason, the Mets offered Murphy a one-year, $15.8 million qualifying offer which he rejected and thus became a free agent. In December 2015, he signed a three-year contract with the Washington Nationals worth $37.5 million. The following year (2016), he recorded his 1,000th career hit. Murphy ended the season with a .347 batting average, 25 home runs, and 104 RBI. He also led the NL in doubles (47), slugging percentage (.595), and on-base-plus-slugging (OPS) percentage (.985). 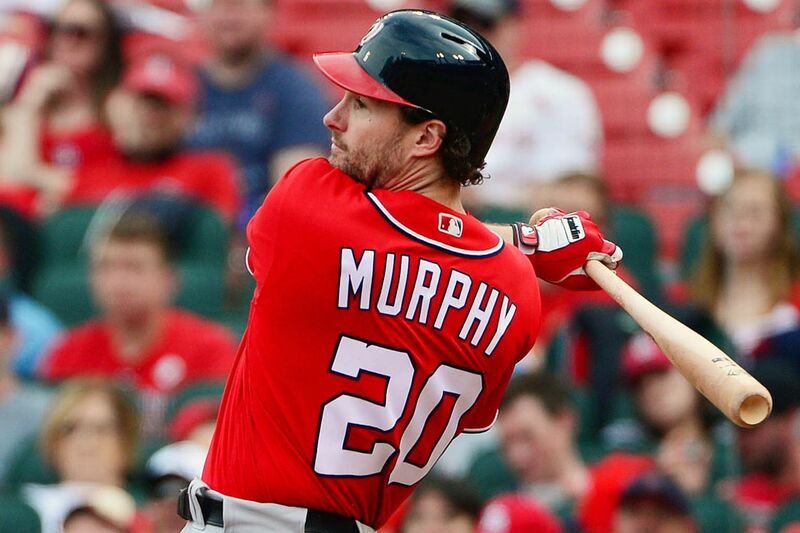 Murphy won his first Silver Slugger Award in 2016 and was also named the best offensive National League second baseman of the year, his Silver Slugger Award came the following year (2017). Murphy’s career stats with the Washington Nationals for the two seasons he has played for them and his total career stats from 2008 with the Mets plus 2016-17 with the Nationals are presented below. Daniel Murphy married his longtime girlfriend, Victoria “Tori” Ahern back in 2012. Murphy and Ahern before they got married fell apart in October 2011. Dan said he thought he had lost Ahern and that he had to pray to God to soften her heart so she will forgive him. The couple reconciled in December 2011 and got married a year later in Florida. They have three adorable children; two sons Noah and Drew and a daughter, Quinn. It is true that Murphy studied under scholarship at the Jacksonville University but it should be noted that he is not the owner, founder or brain behind Daniel Murphy Scholarship Fund. The scholarship fund was instituted in 1989 by two Chicago-based brothers, their kith and kin with the desire to enrich the lives of Chicago youth by providing them access to educational opportunities they are unable to access. Murphy’s younger brother, Jonathan Murphy is also a baseball player, who was selected by Minnesota Twins in the 19th round (580th overall) of the 2012 Major League Baseball draft. Joe also played college baseball at Jacksonville University. In March 2014 Daniel Murphy took a three-day leave of absence from the team to attend the birth of his child, Noah and received heavy criticisms from every quarter for doing so. In June 2014, he was invited to speak at the Working Families Summit at the White House.